In a mysteriously salacious move, both Fernando Martinez and Ruben Tejada were scratched from the Buffalo Bisons’ Friday night game (hat tip to MacksMets via Twitter). Could Tejada and F-Mart be on their way to another organization, as part of a post-deadline trade? Or, could they both be on their way to the Mets, to take the place of players on the current 25-man roster who are being sent away? The Mets might be silly enough to try to make a desperation deal, but for whom, I have no idea. Carlos Zambrano? Manny Ramirez? Adam Dunn? Vernon Wells? Bringing in Manny would make the most sense from the standpoint of selling tickets. Dunn or Ramirez would make the most sense in terms of improving the offense. Zambrano is a frightening thought, even if Oliver Perez is part of the deal. Vernon Wells is similarly scary, considering the length of his deal. Perhaps it is more likely that the Mets are trading two (or more?) current MLBers and in turn will be replacing them on the roster with Tejada and Martinez. So we’d guess the players would be an infielder and an outfielder. Could some team be interested in Luis Castillo? Or the gritty Alex Cora? 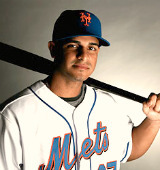 If it’s Castillo, the Mets would certainly have to pick up a big chunk of his salary. Maybe Jeff Francoeur is on the move? Or Carlos Beltran? My guess is Francoeur is most likely on the move, maybe to Boston — a team in need of a corner outfielder and a team that has shown some interest in Francoeur in the past. The Red Sox are also in need of a second sacker, with Dustin Pedroia still on the DL. Jed Lowrie is doing an OK to pretty good job filling in, but you never know — this is the same team that gave Julio Lugo an obscene 4 year/$36M deal. They also had an overvalued appreciation for Cora. According to reports, the Bosox have worked out Carlos Delgado as a possible fill-in for Kevin Youkilis. That in itself should be enough evidence that the “braintrust” in Boston is not thinking clearly, and ripe for a ridiculous deal. All of this, of course, is conjecture. The scratches of Tejada and F-Mart may have meant nothing at all. We will soon find out. Next Mets and Mariners Talking Trade? Joe – the only one not thinking clearly, is you. Did you actually give any thought to what you wrote, before posting? Some of your trade conjecture is off the wall, as is your dissing of Delgado who would be fabulous, low risk, high reward replacement for Youkilis. The Red Sox would be absolutely out of their minds to bring in Delgado. Low risk or not, he’s got nothing left and he’s a clubhouse cancer. Joe is doing his job, which includes giving his opinion. Stop being a hater LongTimeFan.